It has been a long time since I animated a stop-motion puppet and was overdue for a practice session. As I rework my demo reels I realized I have an unruly ratio of robots to people and felt something must be done to rectify the situation. Luckily, John Sumner over at Stoopid Buddy Studios was kind enough to lend me several of his puppets to practice with. 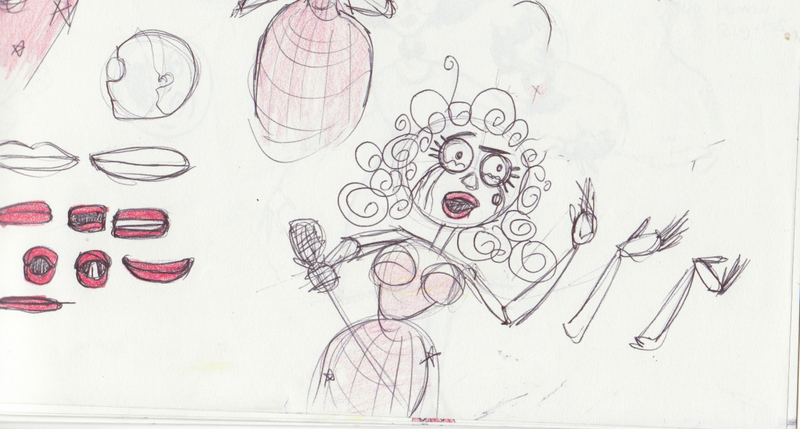 The first puppet is a voluptuous lady in a full dress. 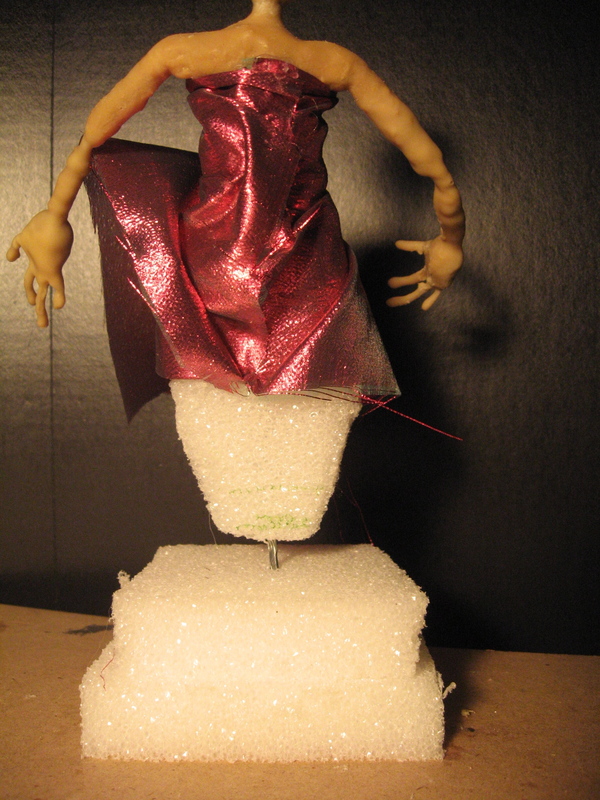 Similar to the You Like Me puppet, she is only poseable from the waist up. I fabricated some eyelids for her and decided to use the mouth shapes I had previously created. Linda’s Film on Menstruation (1974) is a hilarious and cringeworthy coming-of-age tale worth watching in its own right, but it also has a great bit at the end where the producers interview people on the street. Once I settled on a clip, I did track reads in Dragon Stop Motion and spent an evening fiddling with the lighting and setup. The full clip is about 20 seconds and I really hope to get through it in the next few nights. And yes, that’s a popular coffee chain sign behind her. This scene is inspired in part by the Silly Symphony Skeleton Dance (1929). I shot it on a Canon EOS Rebel, using Dragon stop-motion software. I shot using HDR and brought the raw files sequence into After effects to pull the background key. I was pleasantly surprised to see AE recognize the HDR files and I was able to adjust the settings before importing. Last time I posted pictures of this set it looked like this. Beach scene blocking: the reverse close-ups are not included (they’ll be shot with a long lens on a green screen background). Many thanks to Lior Chefetz for his DP help in going through each setup. The final image is the lighting design. Here is the final scene! The start and end clips I obtained from Getty Images, and are not very high quality. But they set the scene, so until I find some way to get a fancy crowd clapping, I will leave these in. I did a little post work on the animation, adding some color correction and adjusting the position for a couple frames (the set mysteriously moved to the left and then back to the right during animation). This speech is from Sally Field’s 1985 Oscar for Places in the Heart. Challenges: With this one I realized how hot lights quickly melt the museum wax. Her eyes were sliding all over. I was going to permanently glue the eyes but I thought I wanted the freedom to move them around. I should have glued them down! The latex joints at the shoulder prevented her from closing her arms easily. The last time she grabs the Oscar, I used fishing line to keep the hands together. Her right hand would not stay closed on the statuette! Not clay nor sticky wax would keep that hand on there. If I had planned her actions a little more precisely, I would have hot-glued it to one hand at least. The second set of eyes (larger irises) were too big and didn’t really work the way I was imagining, so I ended up not using them. I would have made a separate set of mouths to get more emotional range during the lip sync. Overall it was great fun watching her come to life, it’s amazing how much voice and sound can add to a character animation! This is the front now that I’ve re-latexed the head and hands. They are still kind of strange-looking but the deadline approaches, so I’m just going to go with it. I’m really happy with this fabric I found at Lincoln Fabrics. It’s exactly what I had in mind when sketching her out. As a side note, I also realized they sell foam pieces there which might save me some trips to Foam Mart in the coming months. Here is the back side showing the foam section bottom half. 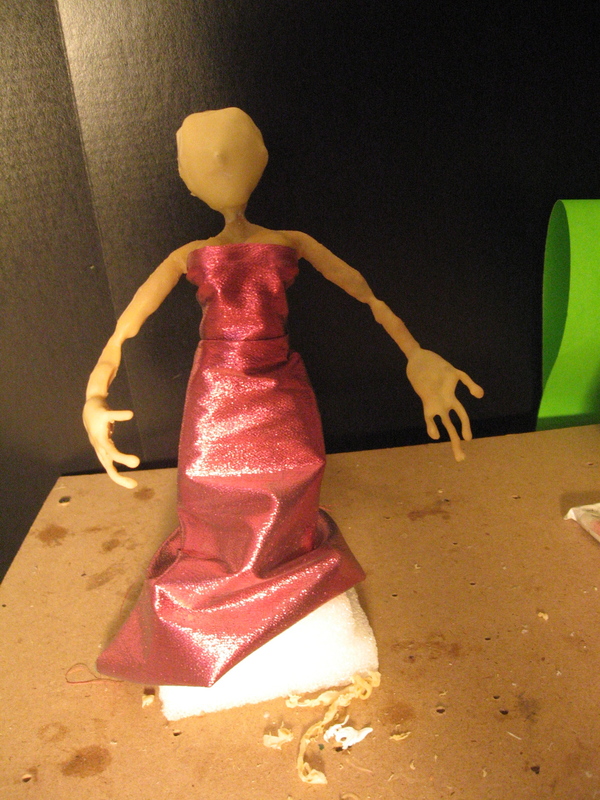 I just used hot glue and sticky wax to arrange the dress around the form. 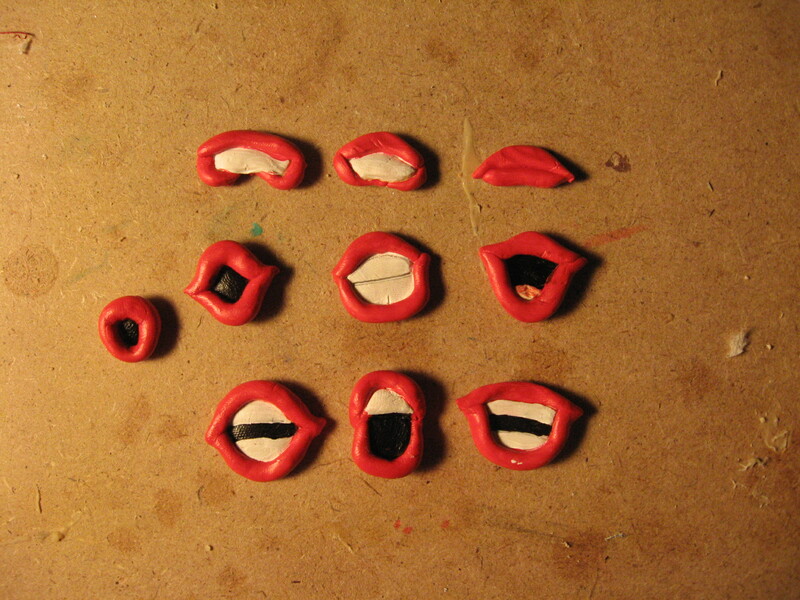 And here are the mouth shapes I baked using sculpy. I love that bright red color! I already did the sound-reading for the voice track – it’s Sally Fields oscar acceptance speech, “You like me!”. But this character is a combo actress/ beauty queen and definitely not Sally Fields. And finally, the golden, curly locks. 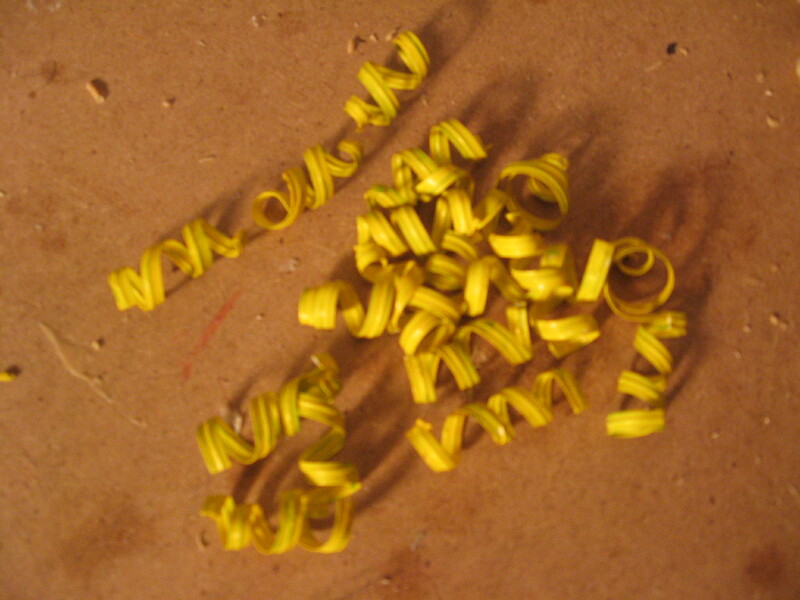 Thanks to Ralph’s at the Marina for donating their twisty-ties to my project! I painted them white and then yellow with acrylic paint. Oh yeah, the oscar itself! 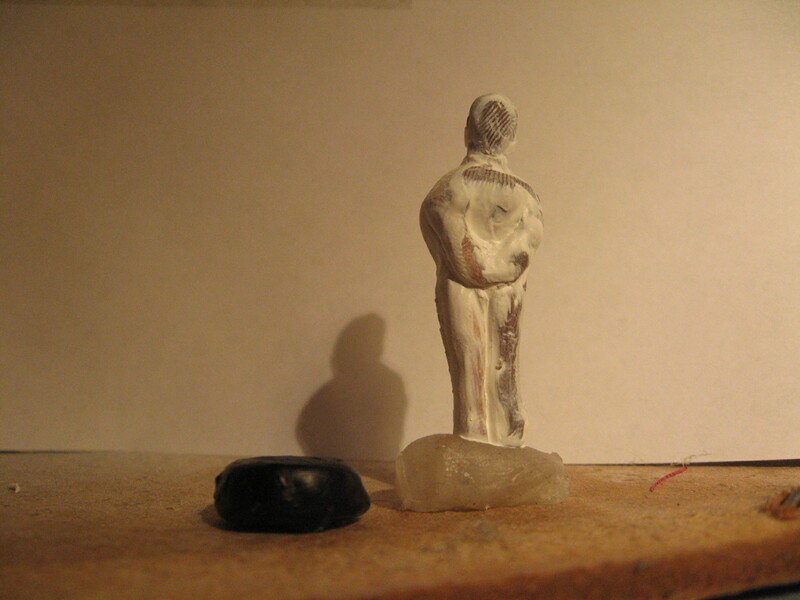 It’s just sculpy and I burnt it (oops) but hopefully it will be okay with paint. I can’t wait for it to all come together! And here is a picture of the puppet as it was a few days ago. 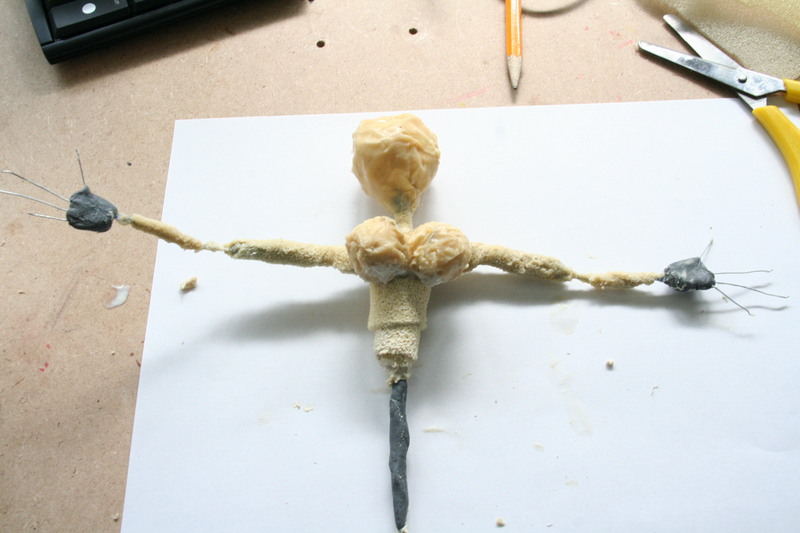 I made a wire armature for the upper torso only – meaning she doesn’t have legs that move. The head and chest were made with wires shaped and stuffed. The whole torso was dipped in latex. I had some real trouble smoothing out the skin, especially for the head. I ended up using a couple layers of heavy acrylic modeling paste to smooth out the face area (pictures forthcoming) and a give a bit of shape to one of the hands. Overall the hands are not shaped well, and next time I will probably spend more time on the underlying structure there. But I’m happy with the overall shape and the proportions as I think it’s really beginning to look like the initial sketch. In this exercise, the Angry Man puppet has a new head. I used a flying rig to shoot the puppet against a black background. His mouth shapes were added in After Effects using the Paint tool. I also added a quick mask around the figure to hide the rig and animated the scale and rotation properties. I consider this a possible test for the Robot Animation scene where the robot falls into and through a spiral vortex. This clay head is a test animation transitioning from pleasure to dismay.